Rain cancelled many planned activities at the Silver Spring Library's annual BookFest last Saturday, but about sixty residents showed up anyway to catch a first glimpse of the new library, to be built at the corner of Wayne Avenue and Fenton Street. 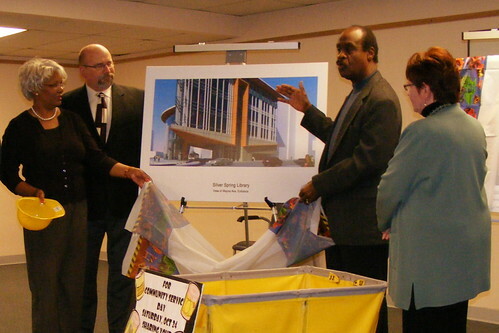 County Executive Ike Leggett, joined by Parker Hamilton, director of the public library system; David Dise, director of the county's Department of General Services; and County Councilmember Duchy Trachtenberg (pictured above) unveiled final designs for the library to a chorus of oohs and aahs. The new library design, which one local Twitter user called "clean, retro-modern goodness," goes heavy on the metaphors. 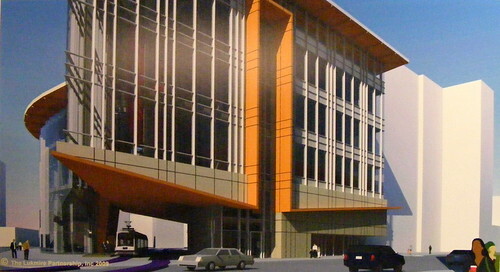 Part of the building is suspended over a proposed Purple Line station at Wayne and Fenton, forming a canopy that Dise compares to "an open book." Glass curtain walls on three sides of the building were meant to "reflect the openness of government," he adds, while reinforcing a visual connection between inside and out. And the exterior will be clad in glass, steel and limestone "similar to the limestone you'd see in buildings throughout Silver Spring," says Dise. The library's Wayne Avenue façade includes a canopy meant to look like an open book. Visitors enter the building through entrance lobbies on Wayne Avenue and Fenton Street before ascending to the library, which occupies the third, fourth and fifth floors of the seven-story complex. The street level will contain a coffee shop and art gallery, with studios for local artists on the second floor. The sixth and seventh floors, meanwhile, will be devoted to community space, including meeting rooms, and offices for several county agencies, including the Department of Health and Human Services. Outside, a public green at Fenton and Bonifant will compensate for the loss of "the Turf" on Ellsworth Drive, two blocks away. Apartments originally incorporated into the design has been spun off into its own building next door, which will be completed later. The complex will eventually include a Purple Line stop and an apartment building, neither of which have been finalized. Two projects that may improve access to the library have been incorporated into the design but won't be finished right away, county officials say. A platform for a future Purple Line station will be built along with the library, but until the transitway between Bethesda and New Carrollton is running, the space will be programmed as a public plaza, Dise explained. Leggett also declared that the library will be designed to accommodate a proposed pedestrian bridge from the library to the Wayne Avenue Garage will be built eventually, despite its rejection by the County Council last summer. Glass curtain walls on three sides of the library represent the "openness of government," according to David Dise. As all county buildings are, the library complex will be required to meet LEED Silver standards for environmentally-friendly design. It also incorporates features of passive solar design, with large overhangs on the east and south sides of the building meant to prevent glare during the summer while allowing solar heat gain in the winter. Site clearing will begin later this year, Dise says, with a groundbreaking to follow next fall. 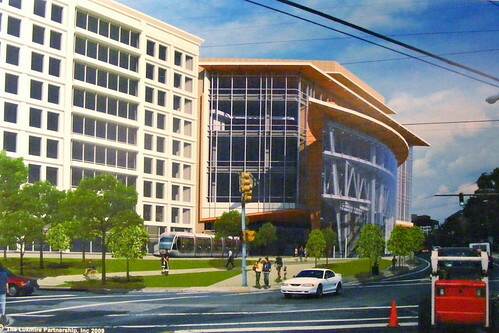 Construction should take about twenty-four months, meaning that the library will hopefully open for business by late 2012. More details, including floorplans and interior renderings, will be presented at a second public meeting, set for Saturday, November 7th from 1 to 3pm in the current library, located at 8901 Colesville Road. 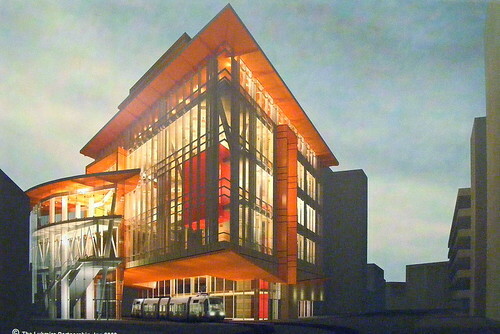 The architects claim there are 2 green roof/garden areas on those overhangs, but none are shown in these renderings. Gues we'll see at the next meeting. Perhaps the old library can be converted into some kind of shelter for the homeless. Maybe small one room apartments that can be rented out at $50/week provided the users go to drug counseling and rehab and job training of some kind. The new library looks great, but one thing is missing.... the convenient parking we have at the current location. The nearest parking is across the street in the Wayne Avenue Garage. So far the County Council has refused to amend the urban renewal plan to allow a bridge between the garage and the library. That means most of those million library patrons each year will have to walk half a block to the corner from the garage, try to get across Wayne Avenue (which will soon have Purple Line trains every 3 minutes as well as all the current traffic), and then walk a half block back to the library entrance. That may not be so bad in the abstract, but try it with a bag of books with small children or when it is raining or snowy. And by the way, the bridge is the cheapest way for the the library to meet ADA handicapped accessibility requirements. The County Council needs to approve building the library bridge! Having a huge parking garage across the street IS convenient parking.